I took this photo of a smiling woman on a Brompton folding bike wearing a pink sundress and white sandals. 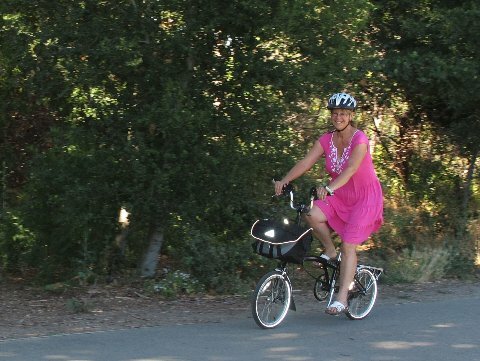 Taken 02 Aug 2010 on the Iron horse trail in Walnut Creek, CA. Looks lovely! And her smile just makes this seem like such a happy moment caught on film. S.
So not what I need to see! Further fueling my folding bike obsession of late! Love the bike bag too.